Food. There's plenty of it around, and we all love to eat it. So why should anyone need to defend it? Because most of what we're consuming today is not food. Instead, we're consuming "edible foodlike substances"–no longer the products of nature but of food science. In the so-called Western diet, food has been replaced by nutrients, and common sense by confusion. The result is what Michael Pollan calls the American paradox: The more we worry about nutrition, the less healthy we seem to become. Real food–the sort of food our great grandmothers would recognize as food–stands in need of a defense from the food industry and nutritional science. Both stand to gain much from widespread confusion about what to eat. Yet thirty years of official nutritional advice has only made us sicker and fatter while ruining countless numbers of meals. Pollan proposes a new (and very old) answer to the question of what we should eat that comes down to seven simple but liberating words: Eat food. Not too much. Mostly plants. Urging us to once again eat food, he proposes an alternative way of eating that is informed by the traditions and ecology of real, well-grown, and unprocessed food. IN DEFENSE OF FOOD shows us how we can escape the Western diet and, by doing so, most of the chronic diseases that diet causes. 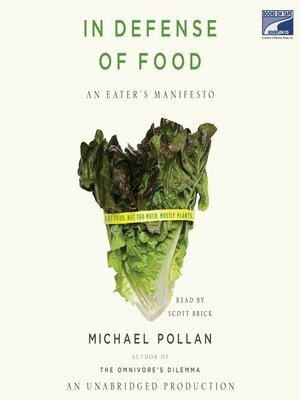 Michael Pollan's last book, The Omnivore's Dilemma, launched a national conversation about the American way of eating; now IN DEFENSE OF FOOD shows us how to change it, one meal at a time.